Photos of XP Days Benelux 2016, 24th & 25th of November, 2016, Heeze, The Netherlands. Agile Tour Brussels has been a great event, likewise previous editions. My preference are simulations / (serious) games / workshops, simply because by ‘doing’ you learn a lot more (and it sticks). This simulation involves a list of issues (impediments) of different kinds and a list of tools / techniques / practices to tackle issues. Some of those practices do really originate in agile / lean, other have been simply recognised as agile / lean because these are often used by agile / lean people 🙂 Some of the practices exist for long time! Actually, any self-respecting ‘real’ manager should know and apply those practices! The goal of the simulation is to discuss the given impediment and to find (one or more) practices best suitable to start solving the impediment. As well, the discussion evolves of who is supposed to take action. Typical areas such as requirements, priorities, budget are the responsibility of the product owner. Typical team impediments should be reflected back to the team by (for example) the Scrum Master (in a Scrum team), and the Scrum Master can assist in exploring how to tackle the issue. It’s important that some actions are taken on by the team itself, so the team learns how to deal with problems in the future. Causal-loop diagrams can be used to analyse how the system will behave when changing variables, or when we are adding a ‘solution’ (or ‘quick-fix’). The exercise involved the creation of a causal-loop diagram regarding the change of having individual versus shared ownership of a system component. See the example below. 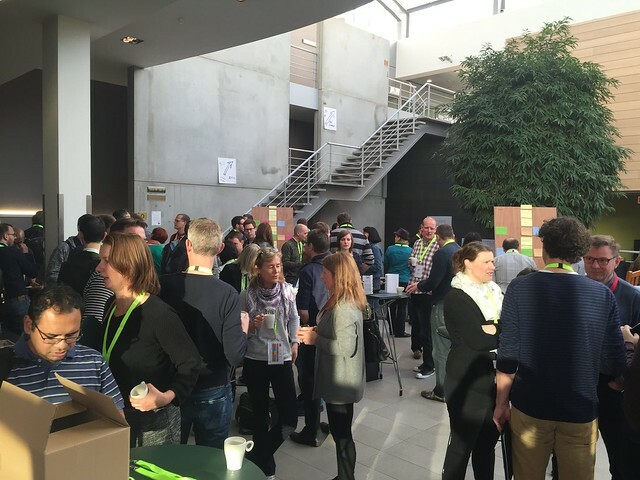 Agile Tour Brussels 2015 is coming up!